Hands on: Huawei Ascend P6 review | What Hi-Fi? Huawei might not be a name you’re used to hearing when it comes to high-end smartphones, but that could be about to change. The Chinese telecoms giant has just announced the latest in its range of ‘P’ series handsets, the Huawei Ascend P6, and from its approach, it would appear it means business. At a rather large event at Camden’s Roundhouse in London, Huawei officially unveiled the handset to the world’s media, with attendees coming from as far as South Africa to see what the company had up its sleeve. The answer? The world’s thinnest smartphone, measuring in at just 6.18mm thick, and looking to really stick it to the big names by offering a premium product at an affordable price. But can it manage it? Let’s take a closer look to find out. Let’s not beat around the bush – the Ascend P6 bears more than a passing resemblance to the iPhone 5. It’s Huawei’s first phone to be made of almost an entirely metal construction, moving away from the plastic design of the P1 and P2 to create a more premium feel. This includes a very Apple-esque metal edge and completely flat brushed aluminium back panel, with the camera sitting flush with no bumps or ridges to accommodate it. The bottom of the phone has a rather nice curve to set it apart from its competitors, and like a lot of Android phones, its front panel is button free, with the only physical buttons sitting on the phone’s right edge. The screen is a 4.7-inch affair, sitting it squarely between the iPhone 5 at 4.5 inches and the Samsung Galaxy S4 at 5 inches. It’s light too, weighing in at 120g – not quite as light as the iPhone 5’s 112g, but good luck at really feeling a difference in a side by side comparison. It’s overall a very well-finished device, and easily the best looking Huawei smartphone we’ve seen. It feels nice in the hand, and its thinness doesn’t make it feel flimsy or overly delicate. Its edges feel less harsh than the Xperia Z, so it sits pretty comfortably in your hand while you’re using it, hitting that one-handed-use sweetspot, plus it’s light enough without feeling cheap too. It’s available in a choice of black, white or pink, though there is also a range of official cases in a rainbow of colours for you to choose from. The Ascend P6 features a 1.5GHz quad-core processor, which moved us around the device pretty quickly during our limited hands on time with it. We noticed a slight delay when moving between landscape and portrait, but found no lag when opening apps and moving quickly between them. The true test of the processor’s performance will be during a full review, as the handset we were testing wasn’t even connected to the internet to test browsing, so we’ll be sure to update you on this then. Storage is on the slim side out of the box, with just 8GB built in, but it does have the freedom of a microSD card slot for boosting this up to another 32GB as you see fit, while also keeping the price down. Connectivity is a little on the slim side too, considering Huawei has said this is a high-end device aimed at taking on the big hitters in the industry. For now, the Ascend P6 is not a 4G-compatible phone, though it was confirmed there would be an update in October or November that would add 4G to its spec list, so you may want to wait until then if that’s important to you. There’s also no NFC, meaning there’s no easy device pairing or contactless payments, leaving it somewhat behind many of its main competitors. Huawei has neglected full HD in the P6, so the 4.7-inch LCD screen is only 720p, which will certainly be a downfall if you tend to watch a lot of HD content on your smartphone. That said, the screen is very sharp, with a close-to-iPhone 5 pixel count of 312ppi (versus the iPhone’s 326ppi), with vivid but natural colours and a bright screen. Like a number of manufacturers recently, the camera on the P6 was a big talking point for Huawei. It features an 8MP f2.0 main camera with a 4cm macro mode, which certainly looked promising on first use. Colours appear very vivid, without being overblown, and Huawei claims that in good light, low light and close-up photography, the Ascend P6 will beat both the iPhone 5 and S4 for picture quality. Certainly, in the well-lit room at the phone’s launch, the pictures looked impressive, but we’ll have to wait for a full review to do side-by-side comparisons to test Huawei’s claims. As for video, the P6 is capable of full HD 1080p video footage, with the rather nice feature of being able to pause and resume recording so you can create your very own Vine-esque type production. Selfies are well accounted for on the Ascend P6 too, thanks to the industry-leading 5MP front-facing camera. Over the top of Android sits Huawei’s Emotion UI skin. Its main aim, according to Huawei, is to make Android easier to understand and more accessible. As such, there’s no app tray, but instead, all the apps appear just a swipe away from the homescreen. Taking centre stage on the main homescreen, you’ll find Huawei’s ‘Me Widget’ – a single widget with a number of customisable sections, including clocks, favourite contacts, weather and favourite photos, for example. Huawei thinks this is a tidier and more effective way to keep all the information you need most, all in one place for quick access and easy viewing. You are able to choose from a number of themes to get a look and feel to the phone that suits you, and there are also a number of nice touches you don’t see everywhere, including the ‘Endurance’ battery saver mode that helps you to squeeze the most of the 2000mAh battery, the ability to set different profiles à la old Nokia phones of yore, and the ability to use the screen with gloves on thanks to MagicTouch’s enhanced responsiveness. It does feel quite simplified compared to other Android experiences you might be used to, and it’s perfectly easy and acceptable to use. However, we can’t help feel that Huawei should have taken a Nexus 4 approach to the phone and opted for a stock Android UI instead. The music player app is nicely designed, with a rather lovely visual layout that blows the stock Android equivalent out of the window. Listening for sound quality in a seriously loud room being pumped full of live DJ music is pretty near to impossible, but what was obvious was a lack of volume. Compared with the iPhone 5, the P6 doesn’t go nearly as loud, which could be an issue for some music junkies. There’s a fairly large option of preset EQ settings – the default being a Dolby Digital Plus option, which can be changed to a genre-based setting or to no processing at all, should you prefer. It will certainly be worth sitting through these to decide what works best for you. The Huawei Ascend P6 will be available in the UK towards the end of July, with a confirmed price of 449 Euros (around £380) or free on contracts around the £21-26 mark. This is quite a difference from its £35+/month premium competitors, and certainly what seems from first impressions, a great price for a promising handset. 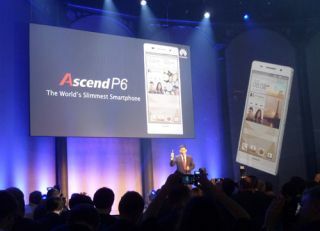 However, the question remains whether the Ascend P6 has the premium sparkle that can draw a consumer away from a name they know to a name they probably don’t – and that will certainly be Huawei’s biggest battle. Look out for a full review of the Huawei Ascend P6 soon and be sure to let us know what you think to it in the comments.